Since you have been living in America, has Poland changed a lot for you? Oh God, of course. I used to go to Poland at least twice a year. I couldn't live without going there. The last two years, actually, I was there four times a year, and just going there every few months, the differences I was noticing, they were just incredible. I totally understand when people go after a few years back to Poland and they are shocked by what happened. But yes, of course, especially in my home city, which is Poznan. Being one of the closest to the western boarders, Poznan is the most influenced from the West, especially from Germany, so the changes are very quick, very fast. What person has most influenced your life or your career? You know, in this career, there are so many people which can help you and which add a little brick to the wall you're building. If I would start to go through my entire career, I would have to say name by name which helped me to build it. But, I think the first one would be my mother, who really encouraged me and allowed me to do what I wanted to do. Being raised in Poland, you were always supposed to get a degree, a job, and work at it. After four years of university, I had half a year left to finish and be an engineer with a master's degree, and I decided that's not what I want to do. Of course, at the time I still lived with my parents. I used to sing and I decided to go to a music school for two years. I took a break at my university and decided to do totally something else. In America, it's so common that you can decide to change careers overnight, but not in Poland. And I think she was understanding, and my father was behind her and they allowed me to live my dream. So, I finished my music school and then I finished the university just for them. I had my diploma, because that's what they always wanted. They'd say, "OK, if that doesn't work, you have a real job." So, I think I would put them first in line. Do you know anything about your family history or heritage? No. Actually, my neighbor once sent me his genealogical tree and then I thought it would be nice if I try to trace who are my ancestors. I never actually did, but that's an interesting question, and I would like to research that because just besides knowing your grandparents, you don't know how far it really goes. But no, my knowledge doesn't go any further than my grandparents. Why did you choose Lucas as a last name? I was going through the Academy Players Directory to find out what is the best match for Peter. Peter is the translation of my real name. I had found probably ten names, which I prepared for my agent and manager, and they chose Lucas. Later when I tried to register Peter Lucas, I found out that Peter Lucas already exists, so I had to add J, which stands for Jozef, which is my second name. 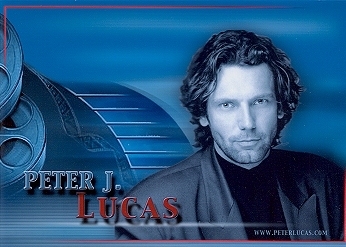 So it's Peter J. Lucas. In the biography on The Last Mission (Ostatnia Misja) DVD, it said your weakness is that you are superstitious. Superstitious in what way? I don't know where they got it from. I remember that when I was going to high school, there were these two poles which were on my way, and they allowed me to make a shortcut if I was late for school. But what I noticed was that every time I went between them, I didn't get a very good mark at school. So I always was avoiding them. That was the only time I remember myself being superstitious. But how that ended up on the DVD …? You were part of the cast of Independence Day, about an alien invasion. Do you believe in UFOs? Well, whenever I stop and look into the sky, I really doubt that there is nothing else besides us. But that's the only time when I think about it. I believe in some bigger force that really guides us, but I never put too much thought into what it is specifically. I don't think they should be called UFOs, but there is something bigger than us. So, do you believe in life after death? I hope for it, but do I believe it? Maybe I do because I feel that any time I lose somebody, a friend, I feel that it is not possible that they just left, that they are watching us, that they are guiding us. So maybe it is believing in life after death. Now I have some very quick questions for you: If you could travel back in time, what period of history would you have liked to live in? When we did not have that much violence in the world. If you had a week to go anywhere and do anything, where would you go? What person, living or dead, would you like to spend a day with? Well, the first that comes to my mind is my uncle. When I moved from Poland to America, he died four years later. When I was younger, every summer I spent at his farm helping him. He made me fall in love with working on the farm, and I was very close to him. Unfortunately, I was not able to attend his funeral. If you had the power to change the world, what would you do? I would like to stop the wars. What is your favorite sound? What is your least favorite sound? My Dad saying my name - "Piotrus". Somebody snoring. Tall, middle-aged guy with a polished sense of humor. If you could change something about your personality, what would it be? I wish I worried less. What would you like people to remember most about you? That I was able to help them. I'm quite open for any advice, but which one was the best? It's so difficult to justify, when you learn so much from others. I think in my career, the best advice was just let it happen, don't push.